PARIS --- A little over a fortnight ago, the Comptroller and Auditor General of India published his annual report on the Indian armed forces. The naval section of this report covers the acquisition and financing of India’s Indigenous Aircraft Carrier and of its air wing, primarily composed of Russian-supplied MiG-29K naval fighters. We have reproduced below, verbatim, the section of the report pertaining to the MiG-29K. A link to the entire report can be found at the foot of the page. The MiG-29K, which is a carrier borne multi role aircraft and the mainstay of integral fleet air defence, is riddled with problems relating to airframe, RD MK-33 engine and fly-by-wire 4 system. Aircraft were being technically accepted despite having discrepancies/anomalies. Serviceability of MiG-29K was low, ranging from 15.93 per cent to 37.63 per cent and that of MiG-29KUB ranging from 21.30 per cent to 47.14 per cent. The augmentation of infrastructure at Visakhapatnam is still at the Detailed Project Report stage even six years after approval (December 2009). The Full Mission Simulator was assessed to be unsuitable for Carrier Qualification (CQ) simulator training for pilots, as the visuals did not support the profile. The service life of the aircraft is 6000 hours or 25 years (whichever is earlier) and with issues facing the MiG-29K/KUB, the operational life of the aircraft already delivered would be reduced. Further, the deliveries of the aircraft under the Option Clause scheduled between 2012 and 2016 are much ahead of the delivery schedule of the Indigenous Aircraft Carrier in 2023, as projected by Cochin Shipyard Limited. MiG-29K is the mainstay of the Indian Navy’s fleet air defence, being the choice of aircraft for both the aircraft carriers, viz. INS Vikramaditya and Indigenous Aircraft Carrier (christened as INS Vikrant) as well as two naval air stations on the East and West coast. The MiG-29K of the Indian Navy is a new generation aircraft and has a newly designed airframe with latest technology, incorporating high strength composites in its construction making the structure significantly more resilient than its predecessors i.e., MiG-29, as indicated in the Cabinet Committee on Security approval of December 2009. The aircraft has fly-by-wire technology and its RD 33 MK engines are a definitive advancement over the MiG-29. The Ministry concluded (January 2004) a contract with the Russian Aircraft Corporation (RAC) MiG for acquisition of 16 MiG-29K/KUB aircraft51 and associated equipment at a cost of USD 740.35 million (Rs 3,568.49 crore), which included 13 aircraft for Admiral Gorshkov (i.e., INS Vikramaditya). Thereafter, the Ministry had concluded (March 2010) an Option Clause contract for acquisition of 29 MiG 29K/KUB aircraft (which included 12 MiG-29K and one MiG 29KUB for the Indigenous Aircraft Carrier (IAC) at a cost of USD 1466.44 million (Rs 6,840.94 crore), estimating that the IAC would be delivered by 2014. The deliveries of the Option clause aircraft scheduled between 2012 and 2016 are much ahead of the delivery schedule of the IAC in 2023, as projected by Cochin Shipyard Limited. As per the Cabinet Committee on Security approval of December 2009 for acquisition of 29 MiG-29K/KUB aircraft under Option clause of the Main Contract (January 2004), the carrier compatibility of MiG-29K aircraft would be tested/evaluated 52 on the Russian carrier Kuznetsov in Russia followed by certification trials from ex-Gorshkov once she is ready. As per Clause 1.3 of the Main contract (January 2004) and Option clause contract (March 2010), aircraft shall mean MiG-29K and KUB aircraft which are capable to be used from Project 11430 (INS Vikramaditya). All 16 aircraft of the Main contract were delivered between December 2009 and October 2012. The first deck landing of the MiG-29K/KUB on the decks of Admiral Gorshkov was undertaken at Russia in July 2012. 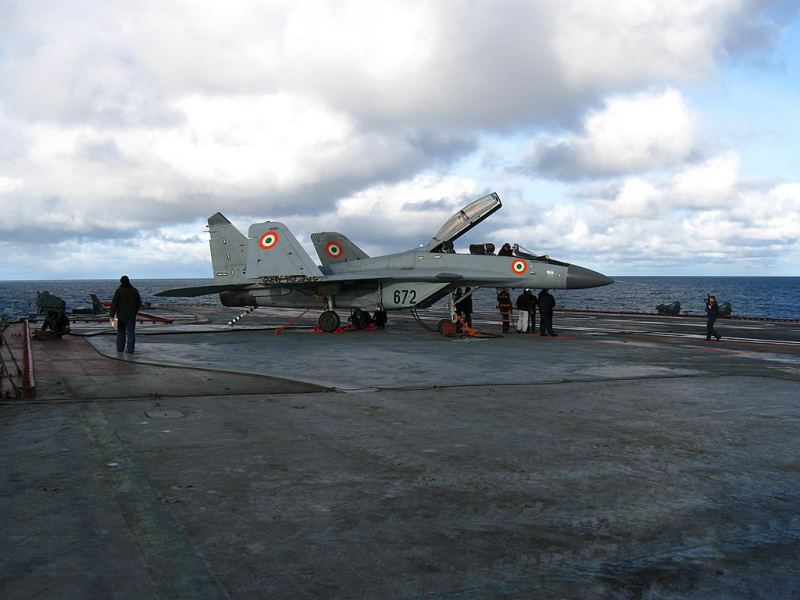 Since the capability of the Main contract aircraft could not be tested/proved from the decks of INS Vikramaditya prior to exercising the Option clause, the quality of the airframe, engines as well as fly-by-wire of the MiG 29K/KUB remained un-assessable prior to exercising the Option clause. The service life of RD-33MK engine fitted on MiG-29K/KUB is 10 years/4000 hours with an overhaul life of 1000 hours. The Navy had placed on RAC MiG a total order for 113 engines along with 45 aircraft (90 installed on aircraft53 and 23 spare engines) under Main and option clause contract. The Indian Navy accepted 21 aircraft up to September 2014. Audit observed (December 2014) that as of September 2014, a total of 65 engines (42 with 21 aircraft and 23 spares) had been accepted. However, since induction in February 2010, 40 engines (representing 62 per cent of 65 engines) had been withdrawn from service/rejected due to design-related defects/deficiencies. The issue had serious flight safety implications, since in-flight engine defects had led to ten cases of single engine landings. Audit further observed from the protocol (September 2014) of the 16th IRIGC-MTC54 that RAC MiG had forwarded a list of 17 modifications which they had scheduled to complete on all engines held in India by November 2014. However, as of September 2015, it was seen that four modifications (out of 17) had been implemented by RAC MiG on all engines and balance 13 modifications would be implemented as and when engines were sent to OEM at Russia for overhaul/repair. In response to audit query about status of repairs on engines withdrawn, the Indian Navy replied (November 2015) that repairs of defective engines were being taken up with RAC MiG based on warranty/non-warranty basis, adding that repair of non-warranty engines were being progressed under IHQ MoD (N) indents. The fact remains that up to August 2015, the number of engines withdrawn from service/rejected was 46, indicating that even as the RD-33 MK engine was considered an advancement over the engine of the MiG-29, its reliability remains questionable. Major defects arose during first (July 2012) and subsequent deck trials of the MiG 29K/KUB on Admiral Gorshkov as reported (July 2013) by Headquarters Western Naval Command, Mumbai to Directorate of Naval Air Staff. The Russian Aircraft Corporation (RAC) certified (May 2014) that aircraft performance of MiG-29K/KUB aircraft under tested conditions of INS Vikramaditya operations mainly conformed to the assigned specifications, however added that weaknesses were revealed during flight tests, which were to be eliminated. Directorate of Air Support Equipment informed (June 2014) RAC MiG that numerous defects55 pertaining to failure of airframe parts had occurred during deck operations despite modifications. Responding to audit query (August 2014), Navy stated (September 2014) that the defects on the aircraft were being monitored and RAC MiG was being apprised of the criticality to initiate suitable remedial measures. Audit, however observed from the protocol of the 18th Indo Russian Inter Governmental Commission – Military Technical Cooperation (IRIGC-MTC) (August 2015) that defects had occurred despite numerous design improvements and modifications and regular occurrence of these defects on sortie to sortie basis was having an adverse impact on Indian Navy pilots training and capability of aircraft for undertaking prolonged deployments. Audit observed (December 2014) from the Agenda points of 6th Reliability and Maintainability Programme Plan (RMPP) for MIG-29K/KUB aircraft that the reliability56 of the fly by wire was very poor, ranging from 3.5 per cent to 7.5 per cent between 01 July 2012 and 30 June 2014 and measures were to be taken by RAC MiG to improve reliability of the system. As per Clause 16 of the Option Clause contract (March 2010), post delivery of aircraft, the Russian Warranty Team (RWT) has to assemble/build up57 the aircraft and offer to the Navy for technical acceptance. The service life of the aircraft is 6000 hrs or 25 calendar years whichever is earlier, as seen from the Option clause contract (March 2010). Out of 19 aircraft delivered up to November 2015, 12 had been built up, with time taken for build-up ranging from two months to fifteen months. The contract did not stipulate any timeframe for completion of build-up/assembly. Therefore, the delays in build-up would reduce the service life, thereby impacting the operational life of the aircraft. As per the Option Clause contract (March 2010), in case the customer’s representatives have any observations during the aircraft technical acceptance, these shall be eliminated by the supplier’s representative before the Technical Acceptance Report (TAR) is signed. As of November 2015, ten aircraft had been technically accepted. The Acceptance Protocols (December 2013 – March 2015) of aircraft showed discrepancies/anomalies with respect to Log cards, passport and defects during pre-flight acceptance of aircraft. The Russians were paid the final 20 per cent towards the cost of aircraft even as the Navy signed the TAR prior to liquidation of limitations Directorate of Aviation Projects Management (DAPM) at IHQ MoD (N) admitted (December 2014) that various defects/discrepancies/ observations were found during the technical acceptance of the individual aircraft, however stated that they were forwarded to Russian Warranty Team for liquidation. ‘Serviceability’ implies that the aircraft is technically available and is not undergoing a scheduled repair or overhaul at any level. The serviceability of the MiG-29 in Indian service. From the above, it is clear that the serviceability of MiG-29K was unsatisfactory, ranging from 15.93 per cent to 37.63 per cent. However, the serviceability of the MiG 29KUB, i.e., trainer aircraft was comparatively better, ranging from 21.30 per cent to 47.14 per cent. The Cabinet Committee on Security (CCS) approved (December 2009) creation of infrastructure at Visakhapatnam for operating MiG 29K/KUB aircraft procured as complement of IAC, to be based on the East Coast at an indicative cost of `218.30 crore. As per the Option Clause contract (March 2010) 29 aircraft were to be delivered between March 2012 and November 2016. Ten aircraft, totally approximately costing Rs 1,680 crore had been technically accepted by the Indian Navy between December 2013 and November 2015. Audit, however, noticed that the Go-ahead sanction for preparation of Detailed Project Report (DPR) for infrastructure was accorded in August 2014 only and the expected date of submission of DPR is February 2016, six years after in-principle approval (November 2009). The Full Mission Simulator (FMS) costing `183.16 crore, is a major training aid of the MiG-29K and is designed for the ground training of a pilot. The MiG-29K Simulator facility had been commissioned at INS Hansa, Goa in May 2013. The MiG-29K training squadron has been earmarked at Goa, the squadron however had not been fully operationalised as of September 2015. As per the protocol of the 16th Indo-Russian Inter Governmental Commission – Military Technical Cooperation (IRIGSC-MTC) (September 2014), un-serviceability of the simulator had prevented its optimum utilization for training of IN pilots. In reply to an audit query, Directorate of Aviation Projects Management (DAPM) admitted (December 2014) that the simulator was assessed to be unsuitable for Carrier Qualification (CQ) simulator training for pilots, as the visuals did not support the profile which required high accuracy and fidelity. As of 31st July 2015, the OEM was still in the process of software corrections as required to make the simulator as realistic as aircraft. Click here for the full report (119 PDF pages) on the India CAG website.